This trip is what started my love that is true for traveling past the familiar to new areas. Looking back through my life, the one area I’ve visited the most is Colorado or the French Alps when taking part in the Tour Du Mont Blanc. It’s usually for the beautiful autumn aspens of it’s today. It’s almost been my home from home. From skiing as a 3-year old to hiking a 14er after school, I don’t get tired of the mountains. As well as the scent of those pine trees on crisp autumn morning or a cool summer evening has stuck with me all of my life. For almost 29 years, from the Colorado Rockies and twice most of my vacation encounters were together with the exclusion of a trip to Yellowstone. One of the greatest parts about visiting Europe, apart from the Tour Du Mont Blanc, is that there is a heck of a whole lot of choices as it pertains to where to go skiing. The tricky part is then occasionally, and picking which place to go, ways to get there. For our four day getaway, we wanted somewhere that was more ‘adorable European vibrant ski village’, than just pure extreme skiing. 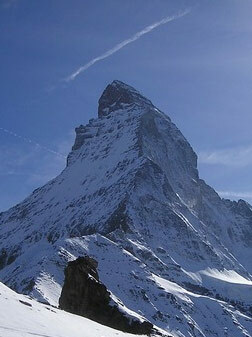 In Switzerland, we determined on Zermatt, after consultation with some pals, along with a lot of interweb hunting. Again it really dawned on me how different mountain holidays were when there was snow. The Tour Du Mont Blanc this was not! Getting there speeds in the ‘moderate’ category, as it takes a four hour TGV (high speed) train from Paris to Geneva, and then two shorter trains totaling three hours up to Zermatt. But, it’s all quick a simple with most train connections timed at only 10 -15 minutes.